Need engaging Sunday school activities? In this world of flashy, loud technology, engaging children in Sunday school activities can be challenging. Fortunately, there's a resource available to make Sunday school planning easy. Not only will you find materials to teach theologically sound, scripturally based lessons, but you will also find suggestions and supplemental bulletins for many lessons — such as the Sunday school activity about Jacob shown below. 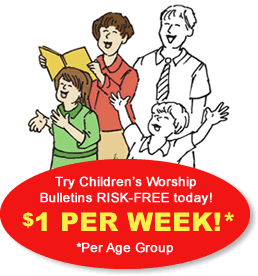 Children's Worship Bulletins is the perfect resource for any Sunday school. Why choose Children's Worship Bulletins? To show you how easy it is to use Children's Worship Bulletins, we've compiled two sample Sunday school activities about Jacob — for ages 3-6 and for ages 7-12 — for you to try. Try them in your Sunday school classes this week! Give each child a bulletin and crayons or colored pencils. Explain the activity, "While I read our Bible story, you'll connect the dots, from 1 through 12 to complete the picture of Jacob wrestling with an angel who looks like a man. When you're done connecting the dots, you can color in the picture." Read aloud Genesis 32:22-31 while the children complete the puzzle and color it. Sunday school activity about Jacob for ages 7-12: What happened next? Prepare the rocks for the lesson. Add enough rocks without clues so that the total number of rocks equals the number of children in class. Put the rocks in a basket or box. Explain the activity, "We're going to solve this puzzle by choosing rocks, one at a time, from the basket. Your rock may have a number and word on it, or it could be blank. After choosing a rock, open it and read aloud the number and word, or let the class know that your rock is blank. Anyone can try to guess the answer to the puzzle before all the rocks are chosen. The first person to correctly solve the puzzle, wins." Allow the children to choose rocks and read the clues until there is a winner. Give the winner a small prize. Read aloud Genesis 32:22-31 to reinforce the lesson.